These hand cut brooches were made by Samantha over at jetta's nest. 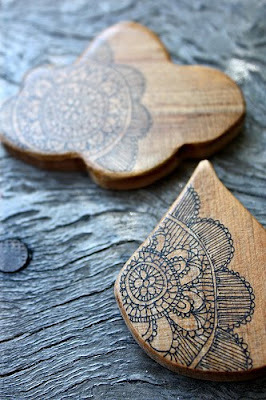 I love the contrast between the rawness of the wood and the delicate doily patterns which are hand drawn. These are part of the Junkie Couture exhibition currently on show at Reverse Garbage. To see more of Samantha's work head to her shops on etsy and blue caravan. The pencil brooch is on my wish list!